Interview with Hamid Mir, Osama Bin Laden’s biographer - Sergio Nazzaro, giornalista e scrittore. 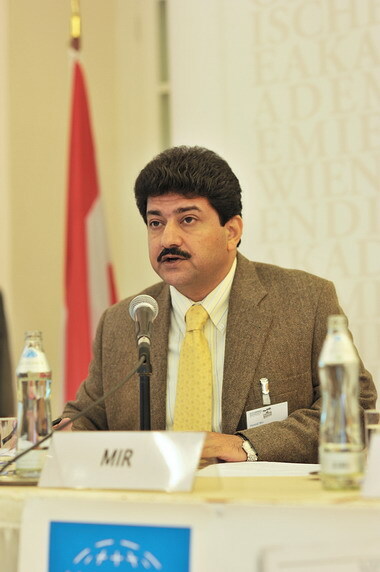 Hamid Mir, known to be the biographer of Osama Bin Laden is one of the Pakistan’s most prominent journalists. He is currently director of Geo TV. Accused by Taliban of being a CIA agent, and by the CIA to be linked to the Taliban, Mir is under surveillance by the services Pakistani intelligence for his articles that delve into the contradictions of Pakistan. A journalist always under threat, but that does not give up. A talk about Pakistan, the war in Iraq and Afghanistan, the riots in Africa and of course Osama Bin Landen and Al Qaeda. How is the actual situation in Pakistan at the moment? Today I heard the news that Musharraf has to be arrested but we will ignore it. Do you think that he really was involved in the killing of Bhutto and what will happen next? “Pakistan was the most dangerous country in the world from 2007 to 2009.US Military advisor David Calculen said in March 2009 that Pakistan may collapse in six months but Pakistan survived. Slowly and gradually a weak democracy forced Taliban to leave Swat. Suicide bombings decreased in 2010 and credit goes to both politicians and Army. Both made sacrifices. Biggest sacrifice was given by late Benazir Bhutto. Just few days before her assassination she told me in her Islamabad house that Musharraf betrayed her by imposing emergency in Pakistan. She said “Musharraf wanted me to come back to Pakistan after the elections but I came back before the election. My life is under threat, Musharraf tried to kill me in Karachi on October 17th 2007 but I survived, if I am again attacked and killed Musharraf will be responsible”. She told me that I must not spare her killers and expose them after her possible assassination. I tried to fulfill my promise by exposing Musharraf in December 2008 in an investigative documentary aired on Geo TV Pakistan. I was the only Pakistani journalist who gave a statement to UN inquiry commission which was set up for the investigation of Benazir. I think Musharraf was responsible for killing Benazir Bhutto. He struck a secret deal with Taliban few days before the murder of BB and released some wanted terrorists. In returned they killed Benazir Bhutto .Pakistani courts have summoned Musharraf. He is not ready to appear in front of courts because US is still supporting him. One day he will be punished for sure at least for abrogating the constitution of Pakistan on November 3rd 2007. He was declared usurper by Supreme Court on July 31st 2009”. Is freedom of press an issue in Pakistan and how you work is going on, I mean, you get pressures doing your job? “Yes freedom of press is a big issue in Pakistan. Apparently it seems that media is free and strong in Pakistan but ground reality is different. My country became the most dangerous place for media in 2010.We lost more than 18 journalists colleagues in 2010 that were killed by Taliban as well as by the secret agencies. I lost at least three very close friends in 2009 and 2010.One of them Musa Khankhel was killed in Swat while he was trying to save my life. We have lost two more journalist colleagues in the first two months of 2011.My life is also under threat these days. Pro-Musharraf elements in our secret agencies are not happy with me. They always try to teach me a lesson. They terrorize me through different means. They banned me for four months in 2007, then again banned me in June 2008 and then tried to involve me in a fake murder case in 2010 but nothing was proved against me in any court. They tried to use a concocted telephonic conversation against me in which I was allegedly talking to some militants and asking them to kill some former secret agents who were kidnapped by the militants. In fact the same militants threatened me before this allegation and secret agencies were failed to produce any credible evidence against me. On the other hand American CIA is also against me. They don’t like Pakistani journalists who ask too many questions. Pakistani Taliban has openly threatened me many times. They arrested me in Swat in 2007 along with my cameraman and producer. We were released after the intervention of local elders. I am under pressure from all sides but I will keep writing truth. This is my life. Risk is the beauty of my profession and one day I may also become a causality of this beauty like many others”. Lately we saw the riots in Tunisia, Egypt and now Algeria and Libya are next. Someone is pointing the finger also to Pakistan. Will be a riot in Pakistan and what can change? “These days US is forcing Pakistan to release its secret agent Raymond Davis arrested for killing two Pakistanis in Lahore on January 27th.Pakistani courts have asked the govt. to hand over the killer to US and he will be tried here. US have postponed all the strategic talks with Pakistan in protest and US is not ready to respect the feelings of Pakistanis. If Raymond Davis will be released without trail then you may see a bigger reaction in Pakistan than Tunisia and Egypt. It will be against US not against any ruler. US will lose all its political allies in Pakistan. I warned Hilary Clinton in November 2009 in an interview that activities of secret US agents are increasing in Pakistan and they are not answerable to Pakistani law and one day you have to answer. She never listened to me and after that I was blacklisted by the US Embassy in Islamabad. Now they are paying the price of their arrogance”. All the riots in North Africa and in the Middle East are about freedom of there are other issues behind? And if the people are changing the old powers, will it last and how will change the face of the international panorama? “I think Middle East and Africa are heading for big political changes. All the pro-US rulers in Muslim countries are under threat now. Muslim armies are no more interested in fighting for US interests. US may not win a war against Taliban in Afghanistan. I think that days of US as a super power are numbered now. Democracy in Middle East and Africa is not in the interest of US. Only Europe will support democratic changes sincerely. Middle East will come close to Europe and will go far away from US”. What do you think of Wikileaks? “Wikileaks played a very important role in Pakistan for exposing the corrupt ruling elite of Pakistan. It was really a blessing. US cables exposed many big politicians who were taking advice from US Ambassador”. We had an interview during the kidnapping of Giuliana Sgrena, today we know, trough the Wikileaks cables that our government didn’t want to dig the story. What is your idea about? “I met Giuliana in Finland last year in an International Media Conference. I never discussed this issue with her. I have no recent information on this but during the Lebanon-Israel war in 2006 one Aljazeera journalist told me in Beirut that some Italian officials told them that they should not give coverage to the kidnapping of Giuliana. It confirms that Italian govt. was not interested in the release of their citizen due to her political views”. Iraq and Afghanistan endless wars, after so many years in both countries what really changed and what needs to be done for real to end the war? “US entered in Iraq for WMDs. There were no WMDs.US was proved wrong. Now they are trying to come out of Iraq.US entered in Afghanistan for killing or arresting Osama bin Laden.10 years have been passed and Osama bin Laden have not been killed or arrested.US is failed in Iraq and Afghanistan. These places became more unsafe under US control. Pakistan is also a causality of US policies in the region.US must get out of Afghanistan. Give the control to UN and form a special group of some countries like Pakistan, Iran, China, Russia, US, UK, France, Germany, Italy, Saudi Arabia, UAE, Turkey, Japan, India and some Central Asian states like Uzbekistan, Tajikistan and Turkmanistan.US should formulate a strategy with the help of these countries and make it sure that Afghanistan must become a “Neutral Country”. No neighbor of Afghanistan including Pakistan should be allowed to interfere in Afghanistan.US should only play the role of a monitor not the role of master.US should not try to minimize the role of Iran by using the bases in Afghanistan otherwise Iran will keep interfering in Afghanistan”. Osama Bin Laden: for many years a name to spread all around, lately seems just a name lost in the memory, what you think of him, I mean he is still alive and had you any contacts with him? “Osama bin Laden is alive. His reach and influence definitely minimized in last couple of years but he is still dangerous. I have no contact with his people since 2006 because one of his close aides was killed in Kunar province of Afghanistan. They were my contacts but I met many Taliban leaders in Afghanistan and tried to get information about him. He is still in Afghanistan but he is safe because he is not moving and not contacting his people very often. I have finished his biography but I am trying to get some information about his latest activities in last 3 years. Especially the alleged secret cooperation of Iran with Al Qaeda because Iran released his son Saad bin Laden recently. I will try to publish this book in 2011”. What is today Al Qaeda, a ghost, an intention, or a real threat? “Al Qaeda is still a real threat. Its sleeping cells are the real threat. We must defeat them politically. A political change in Tunisia and Egypt is the failure of both US and Al Qaeda. Hosni Mubarak was a US crony in Egyptian Qaeda tried to kill him physically many times but failed. Ultimately a political movement in Egypt forced Hosni Mubarak to resign. It’s a good thing. Politics won and Al Qaeda failed”. Coming back to journalism, in Europe and not only we are trying to develop citizen journalism, news and information made by citizens, what is your idea about? “Citizen Media or social media is not very strong in Pakistan but it is growing and people have started using mobile phone messages for organizing political rallies. I am sure Pakistan will survive. Yes we have problems but an independent superior judiciary and vibrant media is the real asset of Pakistan. We will try to force our political leaders to introduce reforms, eradicate corruption, fight terrorism and promote democratic culture. A neat, clean and transparent democracy is the solution of our problems and I very optimistic. We will defeat all the problems through politics not through guns”. If a Prime Minister, like in Italy, would be involved with young women, what would happen in Pakistan? “If a Pakistani PM involved in a young girl then women activists will come out on the roads against him and he will lose his job in one week”.